Marcia Ball remains a powerhouse that shines brightly on the Crescent City’s fertile music scene, mixing Texas blues with the unique sounds of Louisiana swamp. Her latest outing infuses a joyous gospel exuberance with classic two-fisted New Orleans piano, culminating in the self-titled opening track. The energetic declaration continues with the Fats Domino-like “I Got to Find Somebody,” which utilizes a rocking saxophone commonplace in early rock ‘n’ roll. “Life of the Party” conjures up tropical, beach-laden affairs, a nod to her current imprint’s prior forays into reggae and the Louisiana-bred singer’s New Orleans roots that significantly shaped the Jamaican genre. “What Would I Do Without You” crosses Ray Charles with veteran Irma Thomas to produce a soul-charged love song. “When the Mardi Gras is Over” channels the energy of Professor Longhair’s Mardi Gras evergreens, emphasizing the diversity of its people and eclectic sounds. “Pots and Pans” shows a sociopolitical side to Ball, imbued with courage, strength, and self-determination against corrupt segments of society. “World Full of Love” continues the message trend, a gospel-soul duet slice that would fit right in with 1960s Louisiana ballad tradition. “Too Much for Me” is a fun, beer-drinkin’ roadhouse rhythm that ends with the zydeco-peppered anthem “Take a Little Louisiana,” “everywhere you go,” which pays tribute to trailblazers such as Allen Toussaint, Fats Domino, and Buckwheat Zydeco. 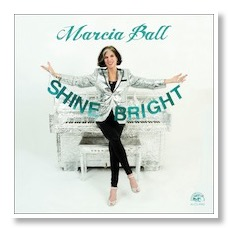 Bold, rollicking, and sassy, Marcia Ball comes out with top honors on this excursion that pays homage to her distinctive Texas-Louisiana blues romp while winning critical plaudits, demonstrating how the American regional storybook is still alive to inspire and celebrate. Wynton Marsalis is among the most pre-eminent jazz musicians of all time and a figurehead on the modern jazz scene. With many accolades (including the National Medal of Arts and the Pulitzer Prize for Music), and associations (including stalwarts such as Sarah Vaughan, Dizzy Gillespie, Sonny Rollins, Herbie Hancock, and Art Blakey), the composer, educator, and artistic director of Jazz at the Lincoln Center in New York City, in which he helped co-found, remains a textbook lesson on the vitality of jazz music and even the impression of classical music on American audiences. His latest endeavor, United We Swing, recorded between 2003 and 2007, features popular music titans such as Bob Dylan, Ray Charles, Willie Nelson, and Eric Clapton alongside solid performers, ranging from gospel (Blind Boys of Alabama), blues (Susan Tedeschi), and Broadway (Audra McDonald). The goal of United We Swing was to have “the exceptional ability of artists to come together through a shared love of the music and listen to each other,” replaying traditional fanfare (“The Last Time,” “Creole Love Call”) and modern records (Lenny Kravitz’s “Are You Gonna Go My Way?” to Natalie Merchant’s “The Worst Thing”). It is a composite of one-night-only live performances that have never been released, featuring Marsalis on trumpet with other experienced instrumentalists. Country music turns up its impact on Kokomo Arnold’s evergreen “Milk Cow Blues,” which became a standard in the Western swing and rock idioms. Lyle Lovett continues the country tradition in “My Baby Don’t Tolerate” before modern R&B takes over in John Legend’s breezy “Please Baby Don’t.” Rock singer-songwriter pioneer James Taylor records his own “Mean Old Man” with a jazz outing before island favorite Jimmy Buffett swings to a lolling rhythm in the aptly titled “Fool’s Paradise”. Carrie Smith exemplifies the professional blues-jazz female singers of the 1920s (Ma Rainey, Ida Cox, Victoria Spivey) in Bessie Smith’s ribald “Empty Bed Blues.” “I Wish I Knew How It Would Feel to Be Free,” a civil rights anthem closely associated with Nina Simone, bridges gospel and jazz before ending in “What Have You Done,” which sees Wynton Marsalis taking up the vocal mantle. 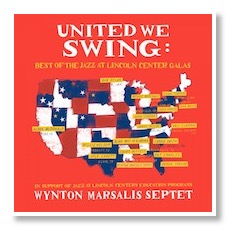 Comprising men and women from different musical backgrounds, mixing familiar recordings with newer ones, United We Swing is a melting pot that tells like a jazz history. The narrative displays disparate sounds and people that created what is known as “America’s classical music.” It is an achievement on Wynton Marsalis’ part, demonstrating the fluidity of jazz music and how it can take on new sounds of a modern era.